Hiroshi Yoshida (1876-1950) Bamboo Wood 1939 16.5 X 11.25 ” woodblock print, jizure, pencil signature, red seal, nice rich color, note that this photo was taken under glass. p.o.r. 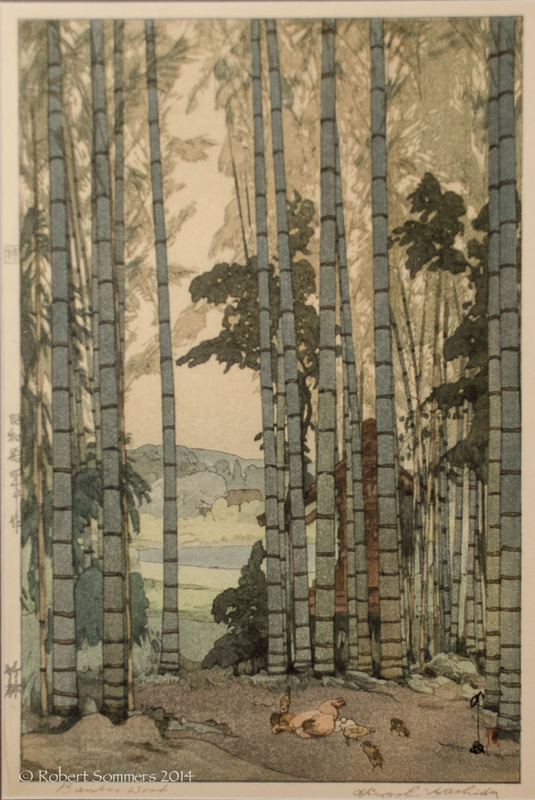 From AskArt: A Japanese landscape painter and printmaker, especially known for woodcuts, Hiroshi Yoshida was born in Kyusha or Kurema, Japan, and was much influenced by his adoptive father who was a painting teacher in the public schools. At age 19, he began art study in Kyoto with Tamura Skoryu, who did western style painting, which was becoming increasingly accepted in Japan. For three years Yoshida studied in Tokyo with Soyama Shotaro. In 1899, he received his first recognition in America with an exhibition of his work at the Detroit Museum, later renamed the Detroit Institute of Art. During that period he traveled on the East Coast of the USA and in Europe. By the 1920s, in addition to oil and watercolor landscape painting, he was heavily involved in woodblock printmaking. His work is exhibited at the Fogg Museum at Harvard University, and numerous other museums including the Museum of Northern Arizona and the Minneapolis Institute of Art.